First up, Teutonic thrash titans Kreator have been announced as the special guests on the Saturday at the festival. Having just wrapped up a handful of dates in the UK with Sepultura, the quartet will be bringing their unique brand of thrash metal to the eager hordes at Catton Park. 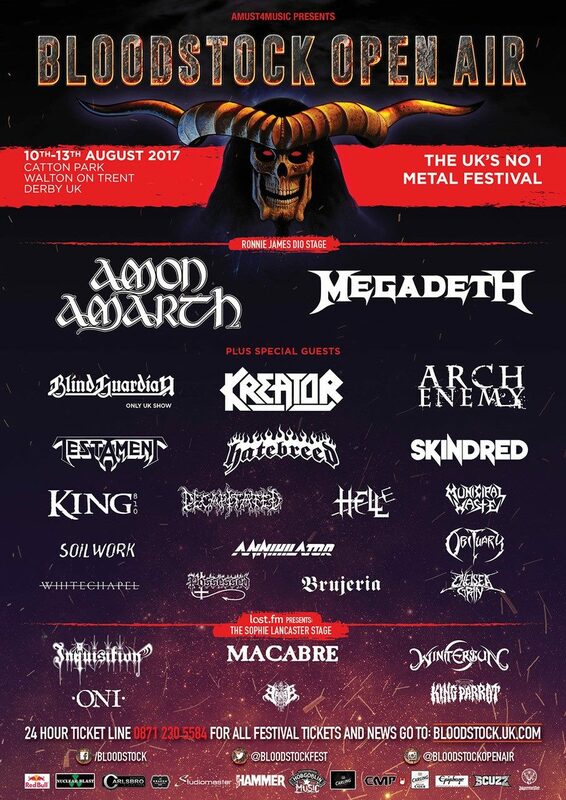 Flint firebrands, King 810 will also appear on the Saturday for a UK exclusive performance on the main Ronnie James Dio stage. Rounding out the announcement, Inquisition will headline the Friday on the Sophie stage and King Parrot will be appearing on the same stage at some point across the weekend as well. Bloodstock will take place at Catton Park, Derbyshire on 10th-13th August 2017. Standard weekend camping tickets are on sale at £139 (plus booking fee), plus limited VIP packages/upgrades and car parking tickets (at a cheaper price than ‘on the day’ purchase) from See Tickets. Children’s weekend tickets are also available, priced £35 (+ booking fee). Camper van pitches have now SOLD OUT.